RockerJewlz: Happy Birthday to me, I feel like A Little Princess! Happy Birthday to me, I feel like A Little Princess! It's my birthday today and I just had to share something funny with you. Last night my hard working husband was getting ready for bed and he said to me, "oh, Honey, I'm SO sorry. I didn't get you anything for your birthday! No card, no flowers...I'm sorry". Well, I raised my eyebrows and replied, "Oh yeah? Well, my birthday isn't until tomorrow, there's still time" and we both laughed. Well, I awoke this morning and immediately checked email at my bedroom computer. My husband had sent a message saying, "Hello Birthday Girl, did you enjoy it? Tell me all about it!". I replied that I had just started my day and there was nothing to tell yet. So, I finished my emails and was walking downstairs thinking about his greeting and I thought, oh! He must left me a little something this morning before work..THAT's what he meant! 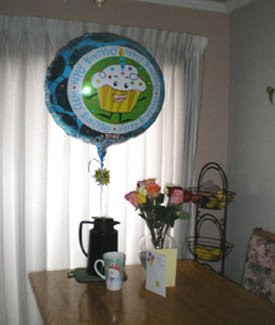 Well..that little something was not only a card, and not only a dozen roses in 4 colors, but also a gigantic cupcake balloon (me LOVE cupcake anything!) 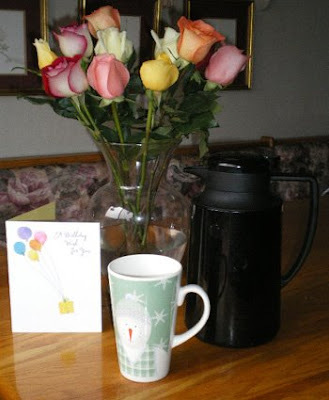 and a fresh pot of coffee (his is the BEST). Wow what a huge surprise from someone who had nothing the night before! 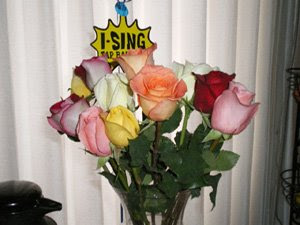 that said "I sing!" (last photo) so I tapped it and this woman, backed up by a full band began to sing "happy birthday" loud and fast! I just cracked up and danced as I poured my coffee...hiLARious! Singing cards I've heard of, but a singing balloon? Never. When I brushed past the balloon to grab an apple...it played. When I brushed against it to open the curtains...it played. This thing is so sensitive it takes very little to activate. 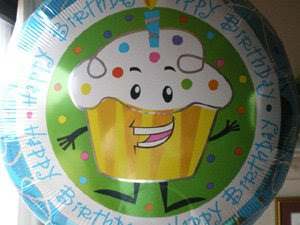 I called my husband to thank him and when he answered I tapped the balloon again to make it sing for him. He said that there he was in the car on the way home with all my gifts and every bump in the road set that darned balloon off...it sang to him all the way home....funNEEE! Betcha that's the last time I get a singing birthday balloon! Next year my birthday is smack dab ON Thanksgiving which is the day we usually travel to see family so I have to say that I'm glad THIS year's birthday is toDAY so I can go see "Four Christmases" with my son before he cooks me dinner for my present. Oh, my other surprise today was my son leaving a video on my worktable... (yes, videos are apparently still in production) of one of my favorite stories, "A little Princess". I love stories of coming of age and rags to riches and this has all that. Good move, Son. Plus, my friend who is retiring next year just contacted me to say his new manufactured home is being installed on his property today. He is at work and can't be there...he is just itching with excitement, so this is a day to remember for several reasons. So you can see I have extras to be thankful for this holiday, two men in my life that sure like to make me feel good. I'm thankful I could entertain you today with my story. Happy Thanksgiving. Well Birthday Girl that was some Birthday!